Posted on August 21, 2014 by Michele D.
My hubbie is on a mission now any time he goes to the store. He’s looking for funny, Kosher Treif food to bring home and test. 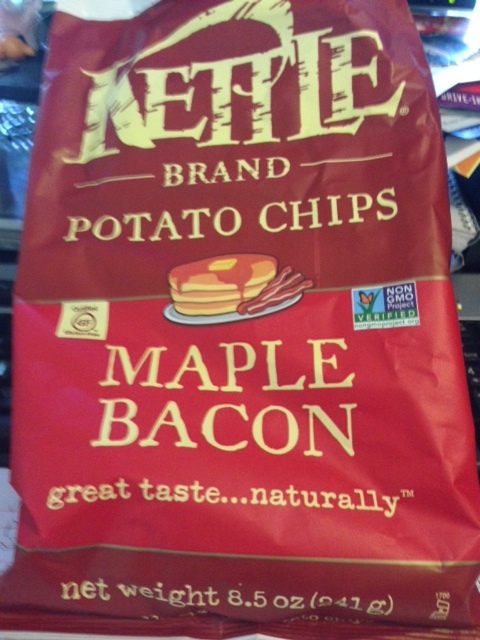 This week he discovered Maple Bacon flavored chips from Kettle. This follows his last discovery of Baby Back Ribs chips and prime steak chips. Keep the Kosher Treif coming honey! Anyone else have a good Kosher Treif food item to share? 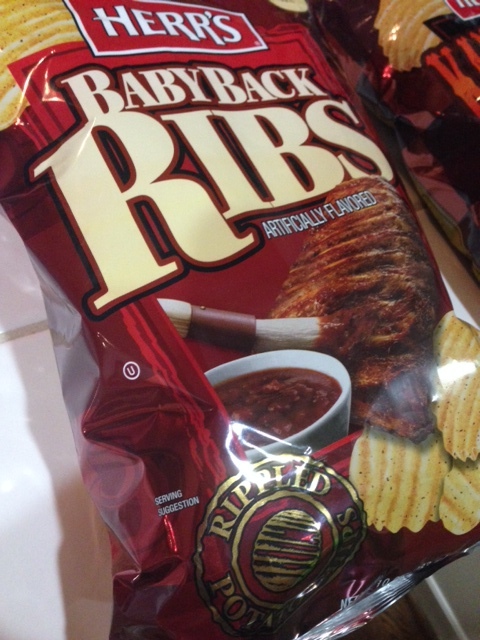 Posted on July 20, 2014 by Michele D.
Hello Herr’s Baby Back Rib flavor chips, which are … wait for it … OU Kosher. As a girl who used to eat treif of all sorts, I can’t say that the chips actually taste like the baby back ribs I remember from my trips to the Rendezvous in Memphis, but then again, I’m not sure anything Kosher could replace that amazing experience. But as a funny Kosher snack that allows me to make-believe I’m eating something from my good ole treif days, Herr’s baby back ribs chips are not too shabby. 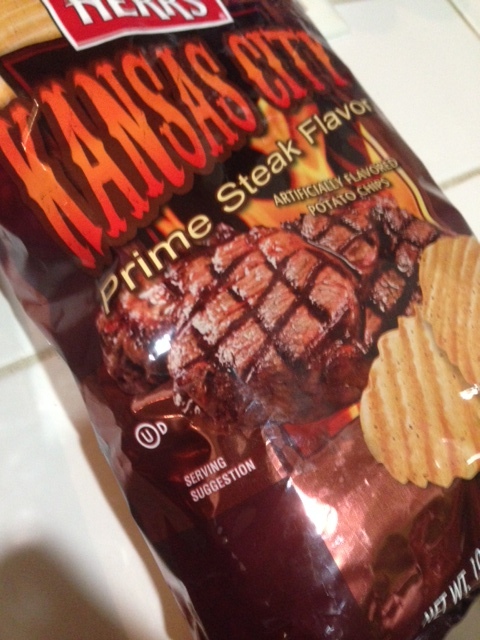 And by the way, the hubby also brought home this snack – Herr’s Kansas City Prime Steak Flavor chips – OU Dairy. Not quite as funny a Kosher baby back ribs but definitely a close second. I haven’t tried them yet but will let you know the verdict. What about you? Have you tried either of these snacks? If so, what did you think? Posted on April 7, 2013 by Michele D.
When I was shopping for Passover this year I came across a yummy (Kitniyot) snack. We don’t ever use Kitniyot when we are preparing meals because we often have guests who don’t eat it but when it comes to snacks for the family, it’s fair game. 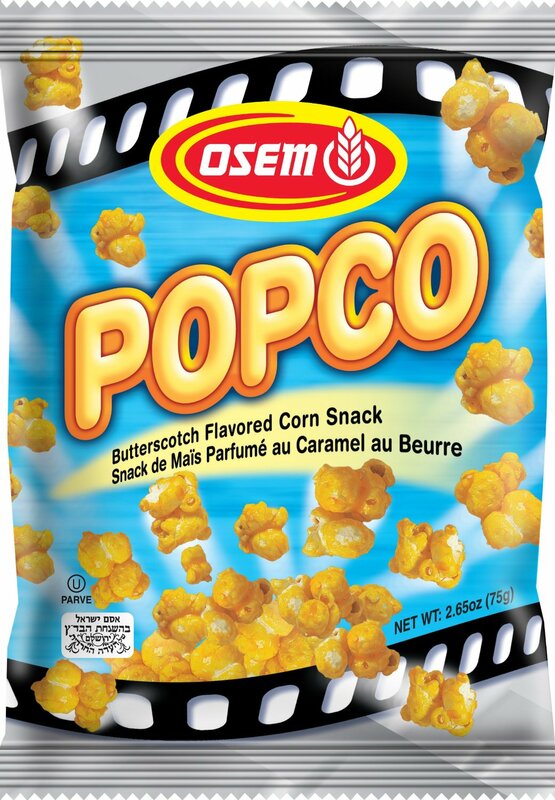 This year, I bought my usual 2 bags of Bamba but also found this yummy, unexpected treat – Osem’s Popco. It was really amazing and the perfect snack to take along with us when we went to see The Croods during the break. I had only purchased 2 bags (and they are small bags) so I sent the hubbie to the store today to see if he could find more. No such luck. So then I went online to see if I could order a few bags … that’s how addicted I am to this popcorn. But instead of placing an order, I came across an interesting blog post called “What snack food corporations don’t want you to know.” It’s not new information to me … snacks cause us and our kids to get fat. I’ve heard it all before but this post was a good reminder so I hit the cancel my order button and decided to give this blog author’s homemade Caramel Popcorn recipe a try instead. Make the popcorn as directed above. In a small pot, melt the butter and add the sugar, salt and honey and mix until everything is dissolved. Do not let it caramelize. Remove from heat and add the vanilla. Pour the mixture over the popcorn and mix until everything is well coated. Spread a thin mixture on a parchment paper lined baking tray and bake at 170°C for 20-30 minutes or until it becomes golden. Mix once or twice during baking to ensure they are evenly baked.